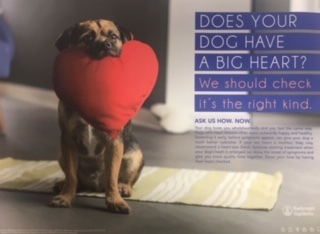 Our Whitburn surgery are offering free heart checks for your pets on February the 14th at 11am. Pets which look fit and healthy could have heart disease. Lifespan can be shortened along with quality of life. Heart disease affects animals of all ages, fitness and breed. Some breeds are predisposed to it. Tea and coffee and biscuits will also be served and each client will receive a goody bag. Have a natter over a cuppa with our team and meet other local pet owners. Book your place early to avoid disappointment. Please call our Whitburn surgery today on 0191 5295500.